A blemish is an imperfection that is located on the skin. For example, blemishes could be dark circles, warts, or even birthmarks. These imperfections are also known as a hyper pigmentation. It is best not to constantly touch hyper pigmentations due to the oily residue located on fingers. Many different types of blemishes are caused by different factors. Wearing a lot of makeup: Wearing a lot of makeup is fine; however, it is washing it off that is so important. The face has to be properly cleaned each time when removing makeup. If makeup is not properly cleaned off, it will clog up the pores and increase the chance of developing acne or other blemishes. Dehydration: If you are not drinking enough water, fewer toxins will be flushed out of your body. Stress: When a person is feeling stressed, their blood sugar levels will rise along with an increase in sebum (natural oils). Poor Diet: A diet which consists of fatty foods is considered to be a contributing factor in face blemishes. Hormonal Imbalances:The natural oil in skin, known as sebum, is produced in excess when hormones are active. Therefore, females will tend to break out with acne during their menstrual period. Dark Circles: Unlike popular belief, dark circles are not only caused by lack of sleep, they are also caused by greater contributing factors such as iron deficiency or nasal congestion. Warts: Overgrowth of the skin which causes it to be elevated. Moles: A small blemish on the skin that is slightly elevated. Acne blemishes: Acne has two main categories: Comedones and Inflamed acne. Comedones consist of black heads, white heads and milia. 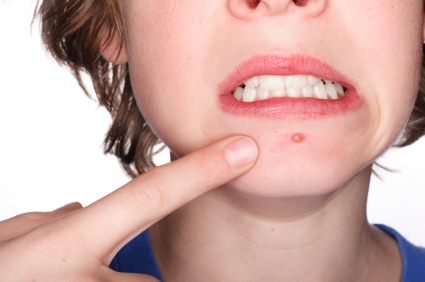 However, inflamed acne consists of cysts, papules, nodules and pustules. To learn more about acne, click here. There are different types of medication available to treat acne blemishes. However, it is best to consult a specialist before trying certain medications.